Naturalized in Canada, Europe, and the United States. USDA PLANTS shows it in 12 US states and 4 Canadian provinces. Cal-IPC received a note for our watchlist from the Santa Clara Weed Management Area about this species but Calflora does not have a record of it in California and it's not in the Jepson Manual. The first record of naturalization was in 1828 in England and it has spread in Europe from garden plantings. Nielsen, C., Ravn H. Peter, Nentwig W., & Wade M. (2005). The giant hogweed best practice manual: guidelines for the management and control of an invasive weed in Europe. USDA PLANTS shows it in Oregon, Washington, and British Columbia, which are similar to California. As of 2005, it was considered an "emerging invader" in Mediterranean France. An "emerging invader" in Mediterranean France (Brunel and Tison). One of the most problematic invasive species in Europe because it establishes monocultures along streambanks, has toxic sap, and creates stream erosion problems. It spreads along creekbanks as well as disturbed areas such as roads and railroad tracks. Based on GBIF maps, it seems pretty widespread in France. Becoming invasive in Mediterranean France. Very invasive in central and northern Europe but those areas are not similar to California. It is also listed on the Washington State Noxious Weed List. Two other hogweeds, H. sosnowskyi and H. persicum, are also considered invasive along rivers in northern and central Europe, although they are not as widespread as H. mantegazzianum. Their distribution is more northern than the part of Europe that is similar to California, however (Cal-IPC). The native range is Georgia (in Europe) and part of Russia. The naturalized range includes much of central Europe, the northeastern and northwestern US and Canada, and parts of Australia and New Zealand. Given the wide range, it does not grow predominantly in areas like California. One of the most problematic invasive species in Europe because it establishes monocultures along streambanks, has toxic sap, and creates stream erosion problems. It reduces the diversity of native flora where it establishes. Many references cited within Global Invasive Species Database page related to this impact. This species has toxic sap that make the skin over-sensitive to sunlight, resulting in blisters. This reaction can occur after only 15 minutes of exposure to the sap but the exposed person does not feel anything until the reaction begins a day or two later. The resulting inflammation causes hyperpigmentation that can last as long as six years. The toxicity was only described in relation to humans; nothing on toxicity to animals. 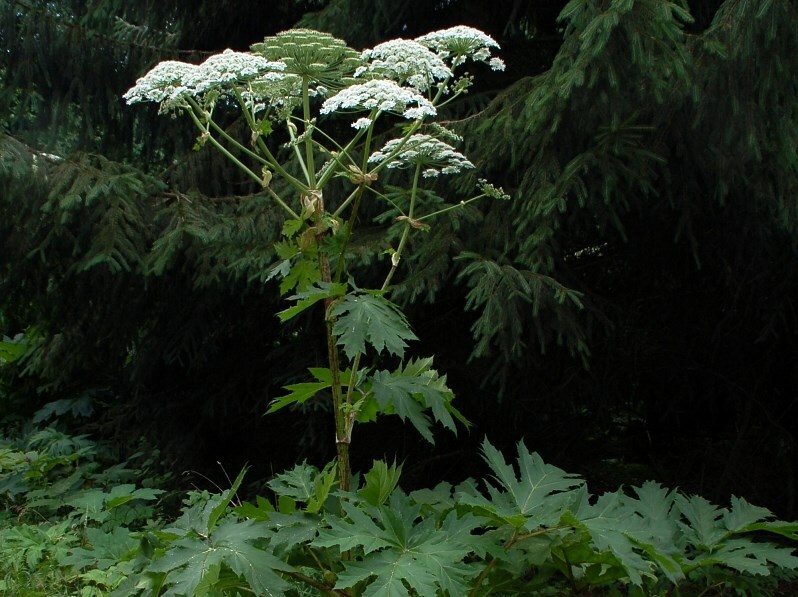 Hogweed lowers the value of recreational land because of its dangerous properties. It produces dense stands, especially in riparian areas, and is a tall herb growing up to 4m, so could create thickets that would be at least difficult to walk through. Reproduction is only by seed. Produces seeds that germinate in early spring. One plant can produce 5000 to 100,000 which remain viable for up to seven years. Hogweed requires cold winter dormancy for seed germination but presumably that means seeds are germinating in the next growing season. It produces many seeds and a dense carpet of seedlings. Typically hogweed grows in a rosette stage for three to four years, then flowers once before dying. In central Europe, plants flower from June to mid-July and seeds are released from late August to October. Between 60-90% of seeds fall within 4m of the parent plant. Seeds have a resinous coating and can stick to sheep or cattle. Hogweed often grows in riparian areas and seeds can be carried by water, especially during floods. Wind causes dispersal at shorter distances, especially during the winter when seeds are blown across frozen ground. Seeds have a resinous coating and can stick to tires or clothing. Comment by Ron Vanderhoff: My only comment is that the suitable range in California for this species appears to be somewhat restricted by to its mesic requirements and its need for some level of dormancy or winter vernalization. If the species were accepted it would seem to be a strongly regional invasive. This does not exclude it from consideration, but does limit its potential CA impact. Reviewed by Ron Vanderhoff and Lynn Sweet.